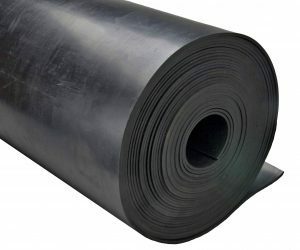 Peroxide Cured EPDM rubber (Ethylene Propylene Diene Monomer) is a specially formulated sheet rubber designed to withstand a higher temperature range than standard EPDM rubber sheet. Peroxide Cured EPDM is ozone and sunlight resistant and performs well in hot and cold climates. This material will also have a better compression set in more extreme climates. Offered in 48 inch wide rolls standard. Not recommended for applications with exposure to oil.